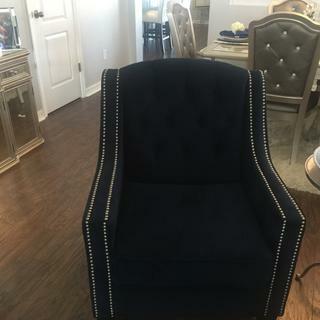 In rich dark blue velvet, this sophisticated armchair is highlighted by an edging of silver nailhead trim. Elegant and graceful, this traditional armchair from the 55 Downing Street line is a welcome addition to your furniture collection. It has rich dark blue velvet upholstery with hand-applied button tufts, complementing beautifully with the dark smoothness of the espresso finish legs. The silver nailhead trim in front completes the quality look. 37 1/2" high x 30" wide x 30" deep. Seat height is 17 1/2" from the floor. Traditional tufted armchair from the 55 Downing Street collection. 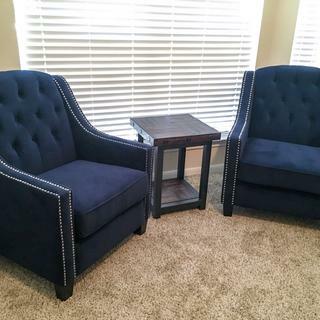 Navy blue velvet upholstery with hand-crafted button tufted details. Fabric is 100 percent polyester. Silver nailhead trim. Espresso finish wood legs. Seat cushion measures 21 1/2" wide x 20 1/2" deep. Seat cushion is removable but not reversible. Holds up to 441 lbs. Using it with a white desk. The color is rich. 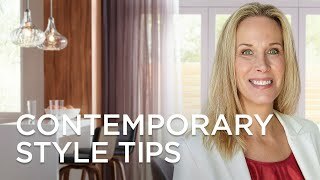 It's a modern take on a traditional style; very glam. The color on this chair says “Ink”, is it a dark navy? It is navy, but not so dark that it's almost black. Ink is a good description: it's about the color of a dark blue ink pen. I would definitely call it navy. But not dark navy. Yes, it is a dark navy. The color is dark navy. Yes, it is dark navy. Can the seat cushion be flipped? BEST ANSWER: The seat cushion can not be flipped. It is unfinished and with velcro on the bottom. The seat cusion can only use one side. The other side has velcro and cheaper fabric. can we have a print fabric in this style? No! The chair it only comes in solid color, oatmeal or blue! Beautiful chair in a soft microfiber, looks upscale. Can someone post a picture of chair to get actual color? BEST ANSWER: Our question and answer forum doesn't allow for pictures to be posted, however you can see multiple views of the item on our product page. We do allow pictures to be posted by previous purchasers of the item if they leave a product review. I don't see any reviews currently posted with a picture of the item, but there are some that note the color. It's a few weeks late for your q/a but we just got these and I posted a pic with my review. The chairs are fairly true to color in the websites photos. They are dark but can show a brighter blue in well lit room. Can you post a picture? Is the color in picture the exact color of the chair? Or lighter/darker? We bought two of the navy chairs and it took a little over a week to arrive. They were well packed in thick boxes, chair covers, and we discovered the screw on legs were in a zippered compartment underneather the actual chair. They are a very dark blue with fabric that feels soft but not like your typical velvet. It is a comfortable, upright seat with a bit of spring to it. Good sized and very classy looking. All the detailing was done well and they are easy to clean. The seat also has a bit of Velcro to keep it in place. Would definitely recommend. Really beautiful. Medium sized - a bit smaller than I wanted. Comfortable to sit in if not for long periods of time. I put it in my living room which isn't used a lot so it is just right for there. Very very pretty style and color but is not that comfortable. It will do for my living room that isn't used much but it would not work in a well used room. The chair arrived promptly; in great condition Love it! Arrived on time, and in good condition. Love Lamps Plus. Lots of choices. 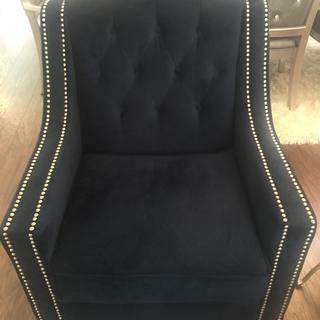 Beautiful navy blue chair with nail heads. Chair looks expensive. Chair color is true to the chair pictured. Beautiful chair for any room! This chair is great in design and would even look elegant in the Whitehouse in Washington DC! it's a store pick up. Looks nice and definitely comfortable. Dark Ink velvet material shows all the dust, lint and swirls which have to be brushed or smoothed out like suede shoes in order to look good.